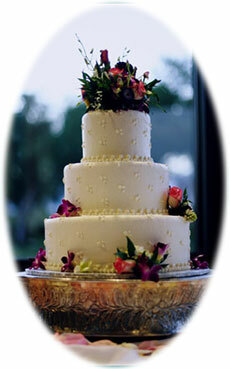 We proudly offer a variety of styles and will create a wedding cake of your dreams. Red Velvet A unique light chocolate complimented with our French butter cream offers a melt in your mouth taste. Dark Chocolate This moist classic is sure to be the ultimate experience for any chocolate lover. White and Chocolate We combine these feather light white layers with dark chocolate filled with fudge filling. Butternut Rum - A light buttery taste with a hint of rum and raspberry filling. Icings - All cakes are frosted with a light Italian Butter cream. Cake charge: ask for current options & pricing (Delivery and set-up included. Cake cutting and service is included in the cost.) If another bakery is utilized there will be a cake cutting charge of $5.50 per person ($2.50 per person for outside venue).